We’d love your help. Let us know what’s wrong with this preview of The Orientalizing Revolution by Walter Burkert. To ask other readers questions about The Orientalizing Revolution, please sign up. In this short volume, Walter Burkert sifts through literary and linguistic evidence with a fine-tooth comb, searching for Mesopotamian, Anatolian and Levantine influences on Archaic Greek culture, especially the writings of Hesiod and Homer. Burkert introduces the book with a historical account of the migrant culture of soothsayers, skilled craftsmen and poets from the Near East who traveled the Mediterranean. 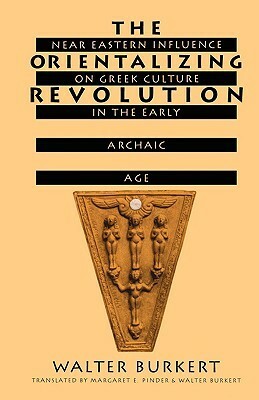 He then puts numerous cases of arts of letters under his microscope, establishing mode In this short volume, Walter Burkert sifts through literary and linguistic evidence with a fine-tooth comb, searching for Mesopotamian, Anatolian and Levantine influences on Archaic Greek culture, especially the writings of Hesiod and Homer. Burkert introduces the book with a historical account of the migrant culture of soothsayers, skilled craftsmen and poets from the Near East who traveled the Mediterranean. He then puts numerous cases of arts of letters under his microscope, establishing modest but persuasive parallels between motifs. Gilgamesh and Enuma Elish receive extensive comparison with the Iliad and Odyssey, and he makes many other salient comparisons besides. In his conclusion, he refers to the preceding matter as "a long and often torturous investigation," and he is not wrong. I was disappointed but not surprised that he wrote this book in his usual tone-deaf style, giving the impression of an active hostility toward elegance or beauty, as though such qualities would spoil the science of the enterprise. I was frequently genuinely baffled by the great effort he expended to analyze incidental tropes or symbols, while ignoring some of the most persuasive and well-established evidence. The obvious Mesopotamian influence on figure sculpture receives scarcely a single notice (! ), nor does the clear similarities evidenced by Enuma Elish and Hesiod's Theogony. He passes the myths and icons of Heracles by in silence; material of which he himself observed "Oriental motifs have obviously entered this complex," in his Greek Religion. Burkert covers his breadth of evidence intelligently and thoroughly; the chosen subjects are pertinent to the field, and the connections made with the 'East' generally very compelling. His methodology, however, no matter how precise, frequently over-emphasises linguistic connections (finding out he was a philologist made a lot of sense) at the expense of the archaeological parallels, even when the latter form of evidence provides much more confident links than the former. It reminded me at times Burkert covers his breadth of evidence intelligently and thoroughly; the chosen subjects are pertinent to the field, and the connections made with the 'East' generally very compelling. His methodology, however, no matter how precise, frequently over-emphasises linguistic connections (finding out he was a philologist made a lot of sense) at the expense of the archaeological parallels, even when the latter form of evidence provides much more confident links than the former. It reminded me at times of Boardman's rather cutting remark that historians will find themselves 'horrified' by the lack of textual evidence for archaic 'orientalising'; I suspect the philological evidence provides something satisfyingly 'concrete' that simple comparison of objects lacks. I can understand the appeal of a 'scientific' approach over a more ambiguous one, and in places the parallels are very compelling but elsewhere, as soon as he admits that the morphologies aren't compatible, all you're really left with is two words that look somewhat similar - perhaps not so 'scientific' after all. The other primary shortcoming of the survey is focus: many will find it surprising that Egypt is not included in this definition of the 'East', despite the clear connections between their artistic legacy and religious impact working in conjunction with Mesopotamian evidence (which is really the main concern of this book), not to mention the overlap in the trade links demonstrated though pottery finds. It would be helpful to see some kind of Egyptological supplement that corroborates the items the book does cover, with a focus on connecting the different forms of evidence Burkert includes (since the evidence presented often has clear 'bigger picture' commonalities, particularly the purification rituals and illness 'remedies' and their links to eastern ideas about pollution of evil spirits, among other apparent religious links that can be supplied with literary parallels in archaic hexameter poetry). Needless to say, a lot of this is still taking Burkert's approach on face value: someone more willing to touch the subject of the problematic elements of 'orientalising' would easily take a harsher view of this book (the most telling detail to me being that nobody, then or now, would describe themselves as oriental), but since 'orientalising' could just as easily be termed 'Mesopotamian-ising' I don't see it as a major issue here. Burkert's text explains something people forget when discussing ancient Greek culture or literature, etc. The Greeks borrowed much from their eastern neighbours, before making it, the influences and traditions of their neighbours, their own and finally producing uniquely Greek art and culture in the "Classical" age (510-323 BC). Very informative, well-written, but more suited to an academic or enthusiast of ancient Greek culture. Walter Burkert was a German scholar of Greek mythology and cult. Professor Emeritus of Classics, University of Zurich, Switzerland, he taught in the UK and the US.